In the US (and a few other places) there has been quite some fuss over a new beer style and what it should be called. The style in question is known by basically three different names; Black IPA, India Black Ale (IBA), or Cascadian Dark Ale (CDA). Bottom line… it is a dark hoppy beer. It’s dark in colour, with a prominent “Northwest” hop aroma—citrusy, piney and resinous. The body has some sweet malt flavours, with hints of roastiness and toasted malt. The flavours should strike a beautiful balance between citrusy-resinous Northwest hops and, to a lesser degree, roasted, chocolate malt or caramel notes. The finish should be semi-dry, not heavy like a porter or stout. Hop aromas and flavours should be prominent, but the malt balance should not be lost in an onslaught of hops. In other words, when closing your eyes, it should not simply taste like a typical American IPA. The first would be the basic hop profile. These beers are brewed using traditional IPA bittering, flavour and aroma hops with citrus, spice and floral characteristics. Typical hop selections would be Columbus, Centennial, Chinook, Amarillo, Simcoe and Cascade or hybrids of these like Warrior or Magnum. The second would be the vastly reduced roast malt flavour contributions. This is done by using debittered malts instead of black patent or roast barley. These malts provide colour without the harsher, burnt flavour profiles of robust porters or stouts. And finally, the third is the much drier finish. This is achieved through the use of very little light caramel malts and high attenuation yeasts. 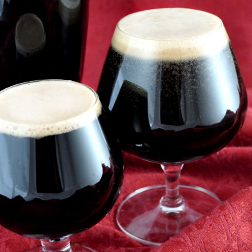 American-style India Black Ale has medium high to high hop bitterness, flavour and aroma with medium-high alcohol content, balanced with a medium body. The style is further characterized by a moderate degree of caramel malt character and medium to strong dark roasted malt flavour and aroma. High astringency and high degree of burnt roast malt character should be absent. Fruity, floral and herbal character from hops of all origins may contribute to aroma and flavour.